Even if you don’t work at home, your partner or your best friend probably does. The shift in communications and information technology has created a new work lifestyle that demands a home office. At minimum a home office should have a personal computer, a printer and modest file storage. Those who work mostly at home also will need a dedicated room they can close off for privacy. 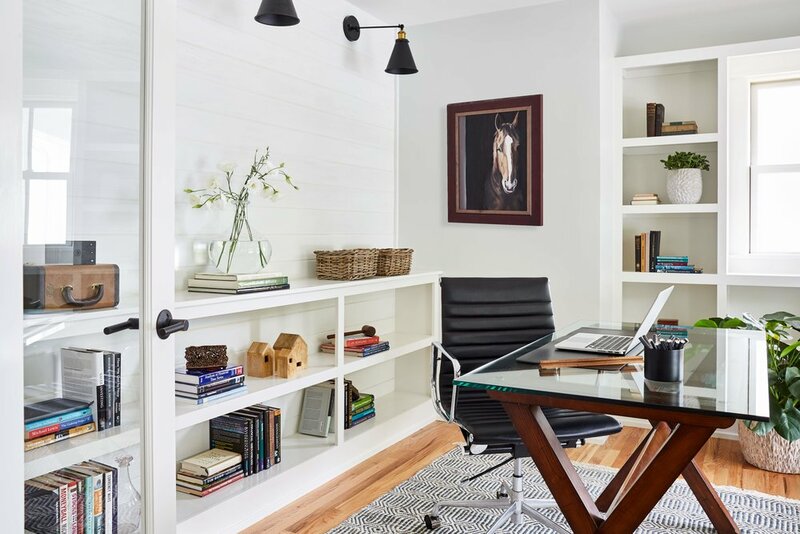 What do you need in your home office? A computer is just the beginning. Consider your desk first. Think about whether the desk should float in the room, as here, be placed against a wall or be built in. The standard desk height is 29 to 30 inches (74 to 76 centimeters). Freestanding desks range in size, but common dimensions are 48, 60 and 72 in. (122, 152 and 183 cm) wide and 24, 30 and 36 in. (61, 76 and 91 cm) deep. Get the largest desk that fits comfortably in your space, as you can never have enough work surface. If you float your desk, leave at least 30 in. (76 cm) between your desk and wall or shelves behind it. On the other side of the desk, allow 48 to 60 in. (122 to 152 cm) for additional chairs and tables, if needed. To read the full article, visit Houzz. Ready to reimagine your home? Contact us to learn how we can help with your next interior remodel, exterior renovation or custom addition.